Treasures of Britain reveals the stories of eight art treasures in the collections at the Ashmolean and the Fitzwilliam Museums in Britain. This program is a fascinating introduction into the world of art history. The Ashmolean Museum is one of the world’s oldest museums. 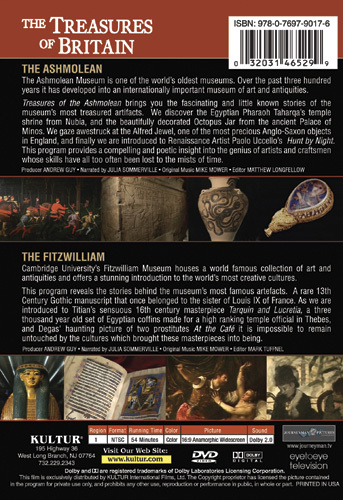 Over the past three hundred years it has developed into an internationally important museum of art and antiquities. 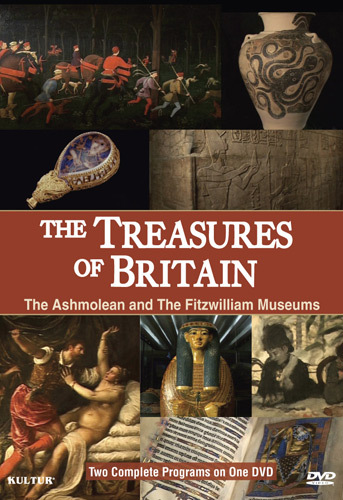 Treasures of the Ashmolean brings you the fascinating and little known stories of the museum’s most treasured artifacts. We discover the Egyptian Pharaoh Taharqa’s temple shrine from Nubia, and the beautifully decorated Octopus Jar from the ancient Palace of Minos. We gaze awestruck at the Alfred Jewel, one of the most precious Anglo-Saxon objects in England, and finally we are introduced to Renaissance Artist Paolo Uccello’s Hunt by Night. This program provides a compelling and poetic insight into the genius of artists and craftsmen whose skills have all too often been lost to the mists of time. Cambridge University’s Fitzwilliam Museum houses a world famous collection of art and antiquities and offers a stunning introduction to the world’s most creative cultures. This program reveals the stories behind the museum’s most famous artefacts. A rare 13th Century Gothic manuscript that once belonged to the sister of Louis IX of France. As we are introduced to Titian’s sensuous 16th century masterpiece Tarquin and Lucretia, a three thousand year old set of Egyptian coffins made for a high ranking temple official in Thebes, and Degas' haunting picture of two prostitutes At the Café it is impossible to remain untouched by the cultures which brought these masterpieces into being.